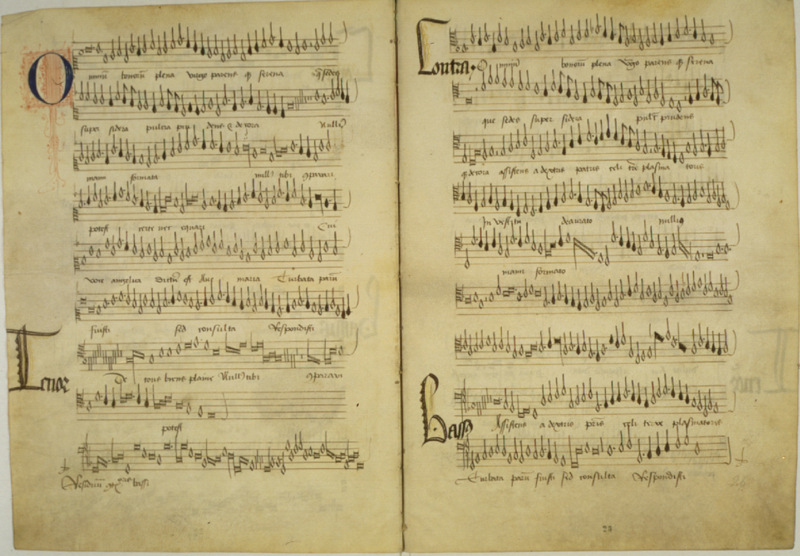 This important manuscript of keyboard music is thought to be in the hand of the great keyboard composer, Girolamo Frescobaldi (1583-1643), who served as organist in Saint Peter's from 1608 until his death. On display is the opening from his Fourth Toccata. A "toccata" is an improvisatory solo work characterized by rhapsodic sections and rambling scale passages alternating with imitative or fugal sections. The opening of the kyrie of the mass by the Burgundian court composer Antoine Busnois is shown here. Like Capella Sistina 14 (not included in exhibition), this manuscript is one of the oldest polyphonic mass sources in the Sistina collection and dates from the late fifteenth century. Recognized as the greatest and most versatile composer of the High Renaissance, Josquin des Prez (ca. 1445-1521) was a singer in the papal chapel intermittently from about 1486 to 1494, serving two popes, Innocent VIII and Alexander VI. 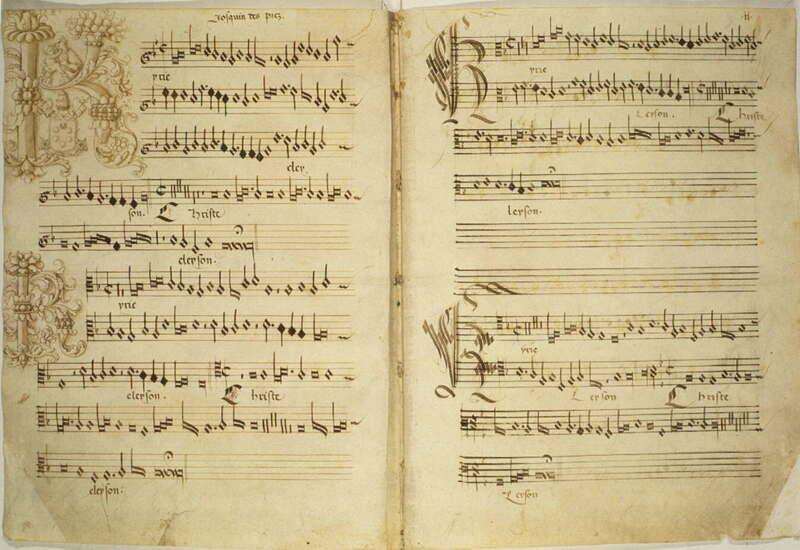 This is the opening of one of Josquin's masterpieces, the "Missa de Beata Virgine," from a manuscript collection of masses dating from the papacy of Pope Leo X (1513-21). This fifteenth-century manuscript of sacred polyphony from the choir of Saint Peter's contains the motet "Omnium bonorum plena" (Full of all good things) by the French composer Loyset Compere (ca. 1450-1518). The piece is based on the famous chanson "De tous biens playne." The composer prays to the Virgin for salvation for the most famous singers of his day, including Dufay, Ockeghem, Busnois, Josquin, Tinctoris, and Caron. 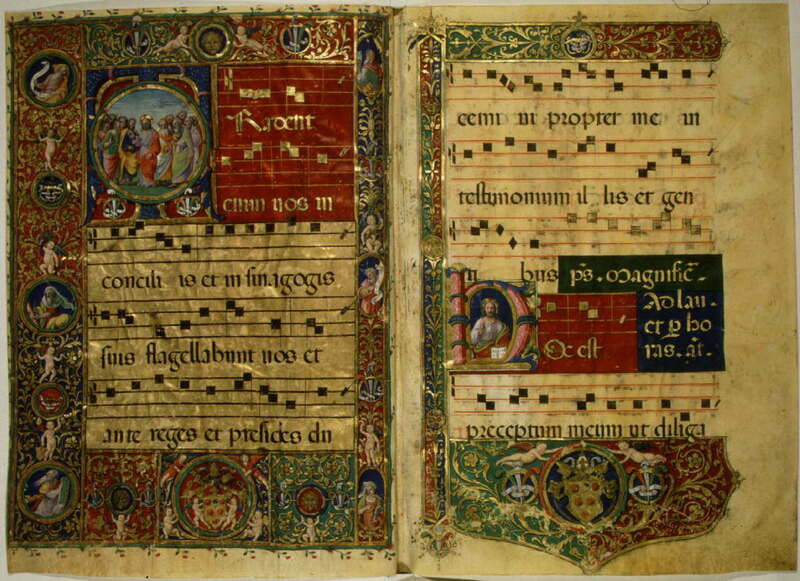 This fifteenth-century manuscript of Gregorian chant, copied for the chapel of Cardinal Pietro Barbo of Venice, was given to the Sistine Chapel choir after he became Pope Paul II in 1464. The lovely illumination of the letter "C" in the setting of the psalm "Cantate Domino" (Sing unto the Lord a new song) depicts a choir of singers standing in front of a lectern. 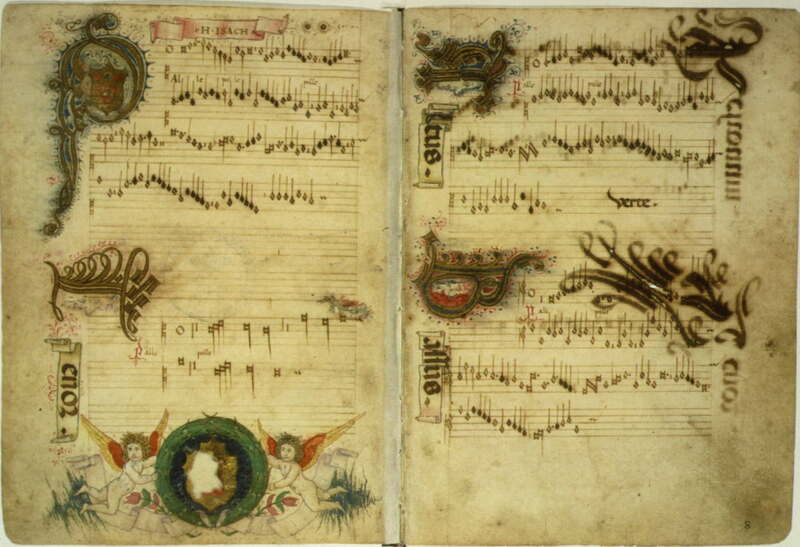 The musical notes on the manuscript in the miniature are legible. Counting down from the top of the manuscript, the sixth entry describes a benefice awarded to Guillaume Dufay, the great Franco-Flemish composer who sang in the papal chapel in the 1430s. The highly prized benefices were lifelong supplements to singers' incomes and did not necessarily require continued residence in the papal chapel. 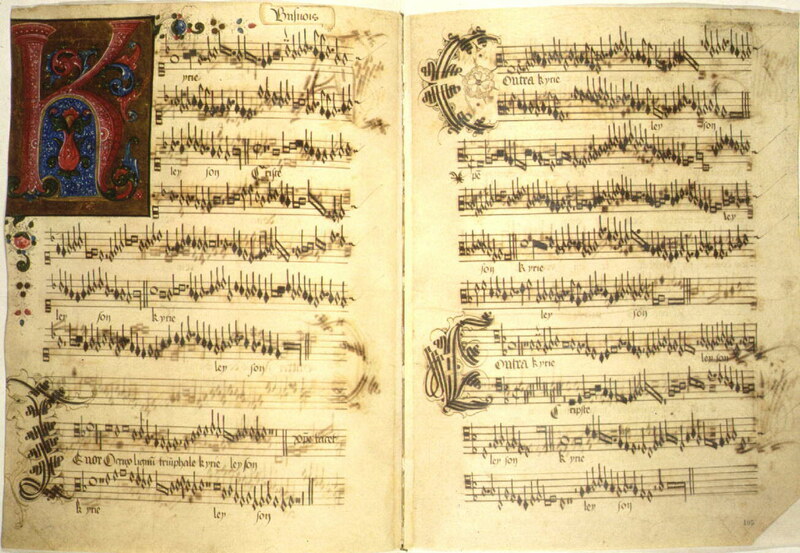 The only major source of Renaissance secular music in the papal collections, this compilation of Franco-Flemish chansons was apparently copied in Florence in the late fifteenth century for a member of the Medici family. The opening work is the textless composition "Palle, Palle" by the Flemish composer Heinrich Isaac (ca. 1450-1517), who in 1484 served at the court of Lorenzo de' Medici. The "palle" of the title refers to the six balls or pills in the Medici coat of arms, which is represented in the illuminated "P" in the cantus part (upper left-hand corner of fol. 7 verso). 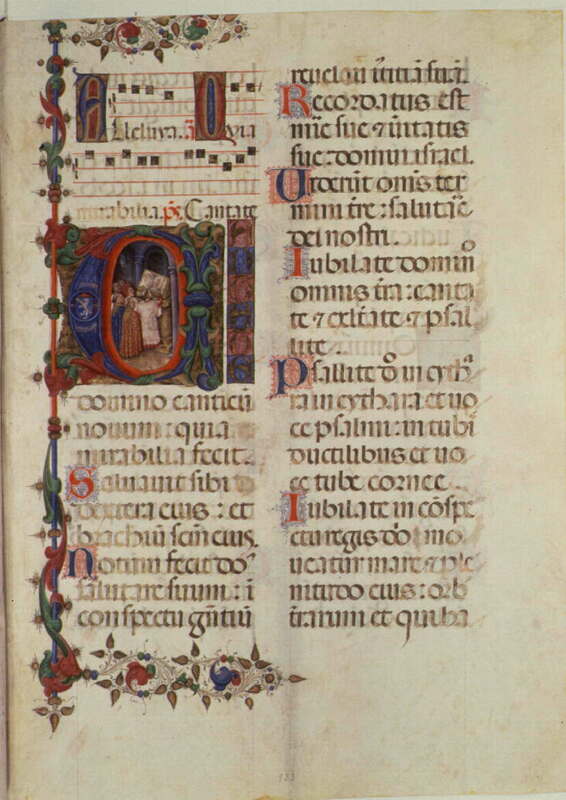 This manuscript is one of the most beautiful and elaborately illuminated chant manuscripts of the Capella Sistina collection. It was written for the great patron of the arts, Pope Leo X (Giovanni de' Medici) (1513-21). The opening displayed here is sumptuously decorated in gold, indigo, ruby, and other vibrant colors, with the initial "O" encircling Christ and his apostles. The lower border shows the Medici coat of arms (six balls in a three-two-one configuration) with the lion heads symbolically representing the pope, Leo X. You can turn right to the Music hall or have a look in the room with some extra objects. You shouldn't forget to have a look at the real nice extra objects, but if you are tired of music you can go through a small corridor back to the main hall.